Re: Is Bitcoin in a bubble? This was exactly my point. Less than 25% of bitcoins even circulating back in 2012. Kept in strong hands. I'll even take my question to the next level and ask what kind of sell off volume are we seeing 5%, 10%, or even 25% of the CIRCULATING volume of all Cryptos? I doubt even 25%. The next number I'd like to see is the value of the total shares sold into the drop. Again, I'd venture a small percentage of the market cap. People can't believe it's a new paradigm? Disney is developing their own coin called Dragonchain. If Disney is doing it, it's real. LOL. Actually, the corporate king of fantasy and movie entertainment may not be the best example to say it's "real" but you get my gist. Brick's wrote: I have not looked but, what kind of volume sell off are we looking at? Is it even 5% of total shares on the market of all Cryptos? 10%? 20%? 25%? I'm guessing at the very least strong Cryptos are in strong hands already and staying there. SilverDoge wrote: You can see the top 100 bitcoin wallet addresses here: https://bitinfocharts.com/top-100-richest-bitcoin-addresses.html Now many of these are cold wallets of the exchanges or miners. You can see the first in and last in dates of all of these, as well as the first out and last out on many of these wallets too. Notice that of the top 100 wallets, 56 of these do not have a first out or last out date. Meaning that they haven't moved anything out. Interestingly wallets 200-300 have even more BTC that have never moved. 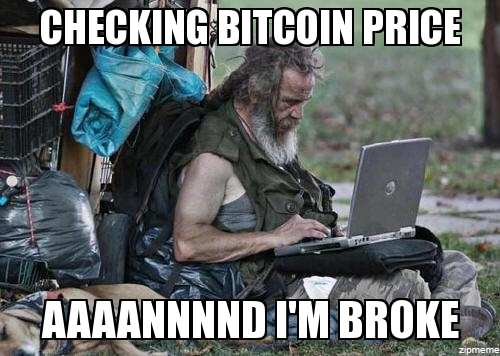 These are the true believers and HODL'ers. You see, the vast majority of those who have REAL money in this space aren't trading it for piddly USD profits day trading. They are the believers that this is a new paradigm. Can you blame them? Bingo - it's not the price that matters. Paypal started the paradigm, but Bitcoin put it in action. Satoshi wanted to create a currency, but Bitcoin was adopted as an asset. Serious, long-term Gold and Silver stackers don't check the price everyday, and neither do Bitcoiners. If you believe in the asset, all that matters is building your stack. It is hard to believe that Bitcoin will ever be a currency. Bitcoin Cash might fill the void, despite what you think about Roger Ver. Carefully selected assets will always beat a big checking account. Even mediocre assets will outperform. It takes a little bit of work to monitor your assets, but your currency is losing value every day, because of inflation and currency trading. Checking and debit accounts are only useful for paying bills and getting cash. I used to maintain a large balance in my checking account. It made me feel secure, until the IRS froze my account. They seized over $20,000, and left me $900. It was all my fault, and we worked it out. They were professionals, but if it can happen to me, it can happen to you. They didn't freeze my safety deposit box or my brokerage account, FYI. If you need a lot of currency, don't "loan" it to the bank. Stash it somewhere. If you have traditionally carried a large balance in your bank account, it can be a bit unnerving to get used to holding a much smaller amount. You'll get used to it. When Hurricane Irma passed through here, the power in my city was out for 38 hours. All the ATMs were out of service. I went to the bodega right around the block, and I was out of cash. The owner gave me an IOU because I've been a customer for a long time. He told me that he had to turn down a lot of sales because he didn't know them well enough, or he didn't trust them. Keep some cash, but buy some assets. When we look at this chart, we are seeing a normal wave pattern of bitcoin behavior. It is easy to forget this in the day to day grind. If we update the most recent numbers, the latest drop is about 63% from the peak, which isn't all that bad considering the recent 556% rise in the last run. As always, the question is when have we bottomed out, and when will the next market bull begin? While I don't have those exact answers, as long as one is long BTC, and believes this pattern will continue, there isn't too much to worry about as long as you've not put in more wealth than you can afford to lose. On Friday, Texas' securities board issued its fourth emergency cease-and-desist order in just over a month on a cryptocurrency company. The orders follow a roughly one-month undercover investigation of cryptocurrency investment programs, said Joseph Rotunda, director of the enforcement division at the Texas State Securities Board. Other states have not yet taken as dramatic steps against cryptocurrency fraud. There was an article last week that talked about how the globalist elites at Davos thought that the current times feel like 2006, just before the last crash. That should give us a year or two before it happens, so hopefully this isn't the beginning of it. Also, I would guess that a financial system crash would help the cryptos, which is obviously not happening right now. The world's elite are partying like it's 2006, and that should probably scare us. Top business and political leaders, who met last week in the quaint ski chalet town of Davos, Switzerland, couldn't stop talking about the booming global economy, record stock markets and President Trump's tax cuts. They toasted the good times with bottles of bourbon that cost several thousand dollars each. But there is something unnerving about all of this: 2006 was followed by 2008, the worst financial crisis of just about everyone's lifetime. Some of the wisest minds at Davos said it feels eerily similar right now, and that's not comforting. Most cryptocurrencies are likely to fail with their value falling to zero, Goldman Sachs said in a note. The investment bank compared the current market to the "internet bubble of the late 1990s." It appears GS wanted to enter into a bitcoin long position sub $5,000 and missed the boat when the bottom only hit $5,800. Solution 1: say that China has banned bitcoin. Oh wait, we've done that 8 times in the last year already ...hmmm, okay. Solution 2: Convince lawmakers that bitcoin is only used by terrorist or pedophiles. Oh wait, CFTC chairman just said we need to be open and respectful of crypto and not stifle innovation. Damn. Hmmm, okay. Solution 3: Just claim that everything is going to crash to zero. I'm sure that will work. Everybody blindly listens to the most trusted name in finance who got billions of taxpayer bailout money, rightttttttt? I assume tdtwedt is also waiting to buy the dip, but we know his entry price is about $5 so he will be waiting until infinity. This is likely true, only because there are THOUSANDS of alt coins out there now and the majority of them are scams or completely worthless in terms of utility. So I would agree that most of these coins will eventually go to zero. However, I believe the overall market cap of crypto will continue to rise... so it just depends on how you define "most cryptocurrencies". Why Goldman's gold man recommends shorting gold. On Thursday Goldman Sachs said it's sticking to its original forecast of gold at $1,050 an ounce by the end of the year. Despite Goldman's role in the financial crisis, and obnoxious statements such as CEO Lloyd Blankfein's claim that the bank is doing "God's work," its sterling reputation has remained in tact. Goldman's predictions are the closest thing to a crystal ball in the financial media, and they regularly draw headline coverage. However, they are often dead wrong. Here are some of the bank's worst predictions from 2014. Forget $40 a barrel oil. Prices could plummet to $20 as a massive supply glut persists until the end of next year. That's the view of Goldman Sachs, which published an oil report Friday headlined "Lower for even longer." In a research note out this week, Goldman Sachs’ top strategists predict that stocks will once again disappoint next year. But when it comes to gold, Goldman has an awful knack for getting it wrong at the absolute worst times. There are investment calls, and then there are the “total recalls.” And Goldman Sachs has done something that approaches the latter, informing its investors that five of its biggest trades this year are not going to work. Investigators in the fraud division of the Justice Department have obtained chats and e-mails from Goldman that appear to implicate the company in manipulating the price of Treasury bonds, according to two sources familiar with the investigation. Consider this example from Goldman Sachs: “We are pleased to put these legacy matters behind us. Since the financial crisis, we have taken significant steps to strengthen our culture, reinforce our commitment to our clients and ensure our governance processes are robust.” This is Goldman’s rhetorical attempt to cleanse itself of the massive fraud it committed in selling tens of billions of dollars in worthless mortgage investments to its clients, contributing to the crash of our economy in 2008. Goldman Sachs Group Inc. traders turned in their worst first-half performance since Lloyd Blankfein rose from that business to become chief executive officer in 2006. Revenue from trading stocks and bonds in the first six months of 2017 tumbled 10 percent, dropping to the lowest level since before Blankfein took over from Hank Paulson 11 years ago. Second-quarter revenue from the fixed-income unit plunged 40 percent. Goldman Sachs, the Wall Street bank that supplied some of Trump’s top economic advisers, keeps telling its clients to expect a “modest” impact from the Trump-GOP tax plan. "Every time bitcoin was in the news, be it positive or negative, the price went up accordingly," van der Burgt said in a phone interview with CNBC on Wednesday. Van der Burgt said the correlation between Google searches for bitcoin and the cryptocurrency's price was almost a "perfect match" until the end of 2017. He said it might not be a coincidence that was also when bitcoin futures markets were introduced. "My take on it is that because of the introduction of futures, that might have deflated the bubble before it got to a level where it might burst completely," he said. Separate research published in May by researchers at the San Francisco Federal Reserve also found bitcoin's price dive was linked to the launch of a futures markets.